There are 4 main power sources for smoke alarms; 9V battery only, hardwired, hardwired with a rechargeable battery and 10 year Lithium Ion battery smoke alarms. Depending on when your house was built or renovated there are different legal requirements about which type you are required to have. 9 volt battery smoke alarms are the cheapest option, and they can be installed easily in any location because there are no cables. However, the battery in these smoke alarms must be changed every year. As the battery is the only power source for this type of alarm, there is no backup if the batteries dies or fails. One thing to consider before buying battery-only smoke alarms is that Victorian law requires all homes built after 1997 to have hardwired smoke alarms. Hardwired smoke alarms are powered by 240V mains power and also have a backup 9V battery. This offers the added security of having 2 sources of power in the case of power failure, which makes them much more reliable than battery-only smoke alarms. Keep in mind that the 9V battery still has to be replaced every year. These smoke alarms are a good choice for your home as they come in both photoelectric and ionisation models. They are also compliant with Victorian requirements that newer homes built after 1997 have hardwired smoke alarms.These laws also apply to rental properties. If you are renovating or extending your home, it’s a good time to consider having hardwired smoke alarms installed. It is much easier to install cabling during a building project, rather than in existing homes (but it’s still possible!). Hardwired smoke alarms must be installed by a licenced electrician. Kenner Electrics installs quality Clipsal hardwired photoelectric smoke alarms. Do you want to avoid the hassle of changing your smoke alarm batteries every year? With the adoption of modern Lithium-Ion batteries, there are now options with a battery that lasts for the whole 10 year life of the smoke alarm! Kenner Electrics recommends this option for its reliability and ease of use. These alarms are hardwired to 240V mains power, and also have a lithium ion backup battery that is rechargeable. The rechargeable battery will last for the whole 10 year life of your smoke alarm without you having to change any batteries! The upfront cost of this option is slightly more expensive than standard hardwired smoke alarms, but when you consider the savings in battery costs it becomes the smart much more comparable. These smoke alarms are battery powered, but the battery is designed to last for 10 years, meaning you don’t have to change the batteries! However, this option only has 1 power source so may not be as reliable as dual power source hardwired alarms. The major benefit of rechargeable battery smoke alarms is that they are very flexible and easy to install. As there is no cabling, they can be installed in locations where it is impossible to run cables. So even though the cost of the alarm is more expensive, the installation costs are lower. Update your smoke alarm to a hard-wired photoelectric rechargeable smoke alarm and you won’t have to change the battery for the life of your alarm! 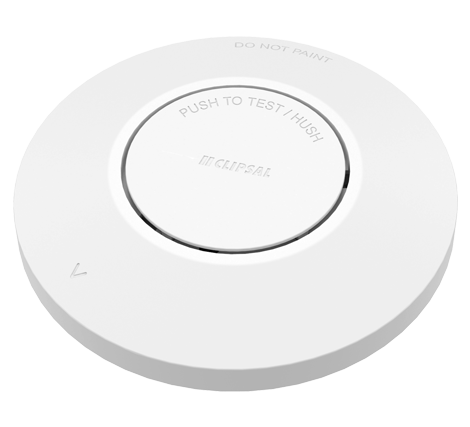 Kenner Electrics installs quality Clipsal photoelectric smoke alarms (rechargeable options available).